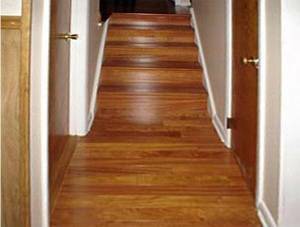 One dilemma often faced by homeowners is what direction to install the hardwood boards or planks in any specific room or throughout the whole home. The subfloor and joist direction. Subfloor and joist direction: Newer homes are constructed with a group of joists and a plywood or other wood composite sheet material installed on top of them. To prevent your floor from sagging and having the board joints separate, over time, it is wise to have the boards run perpendicular to the floor joists rather than parallel, as shown in Figure 3. 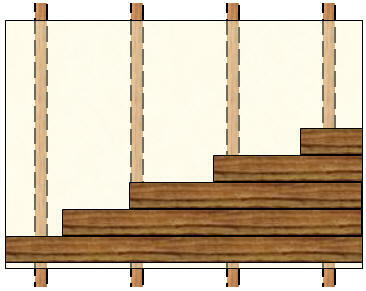 Figure 3 - Direction of hardwood boards over plywood or composite material fastened to floor joists. If your home has a subfloor that is thinner than 3/4 inch you should install 3/8 inch plywood sheeting on top of that subfloor, ensuring that joints overlap the older subfloor. Use construction adhesive and flooring screws driven into the joists to secure the new plywood. Considering the expense and the life that a hardwood floor offers, it is penny wise and dollar foolish not to prepare the subfloor properly. With the new layer of plywood sheeting, you can install your hardwood flooring in any direction that you choose. In older homes it was not uncommon to install 1 inch boards on a 45 degree angle to the floor joists. If this is your situation you should inspect the boards and replace any that may be damaged or sagging. Check the fasteners, which were generally nails to ensure that they are properly seated and where necessary insert some additional flooring screws to secure any loose boards. There is no need to install additional subflooring material, providing you are not running the new hardwood flooring in the same direction as the old floor boards. 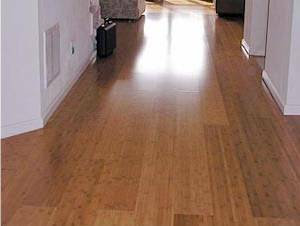 If you have pre-stressed or cast concrete you should consult a professional for proper installation of the hardwood flooring. If you have a concrete floor that was poured on site, you should follow the manufacturer's instructions for the installation of their hardwood flooring products. 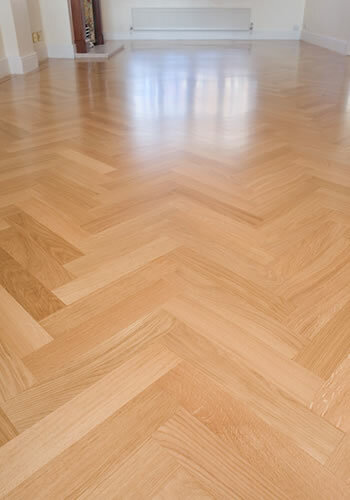 Aesthetics: As a rule of thumb, hardwood flooring is generally installed perpendicular to the entrance into the room or hallway, as shown in Figure 1. Why? Because it is the easiest way for the installers, there is less cutting and trimming, it takes less time and hence they make more money! Figure 2 shows the hardwood flooring installed widthwise to the hall and entrance. Consider using a borders and/or a patterned installation as shown in Figure 4, especially if this is a DIY home handyman, home improvement project. It may take a little longer to complete the installation, but it will wow your neighbors and increase the value of the installation exponentially.